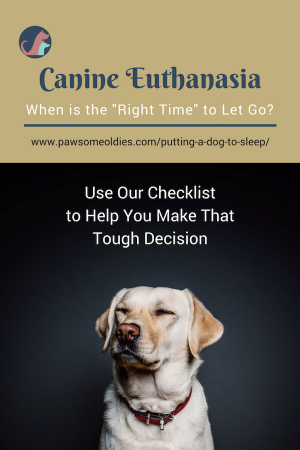 Putting a Dog to Sleep - When is the "Right" Time to Euthanize Your Dog? Putting a dog to sleep – canine euthanasia – is a final gift of selfless love and kindness that we give to our fur babies. As parents of old dogs, we all dread the moment when we have to make that final tough, heart-wrenching decision. When is the “right” time? Will my dog let me know? How can I be sure that it’s not too early, or too late? These are some of the questions that visitors to my other site’s Cancer Forum ask all the time. The truth is, no one can tell you for sure when the right time is for YOUR dog. Not even your vet. You need to make that decision yourself. But there are questions you can answer that may help guide you to your decision. Putting a Dog to Sleep – Is it Time? First, you need to assess the quality of life of your dog. If she can no longer enjoy a good quality of life, is always in pain, doesn’t want to eat or play, then maybe it’s time. 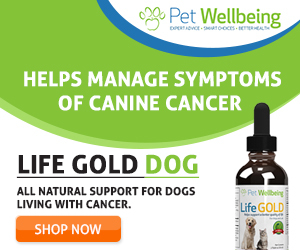 Second, you need to assess some practical issues, such as the costs of treatment, the time involved in getting the treatment, the time involved in caring for the dog at home, whether it’s practical to care for the dog at home, etc. Here is a checklist that may help you assess if it’s time to seriously consider euthanizing your dog. Download it and answer the questions honestly. If most of your answers are “yes”, then you may have to really give the matter some serious thoughts. 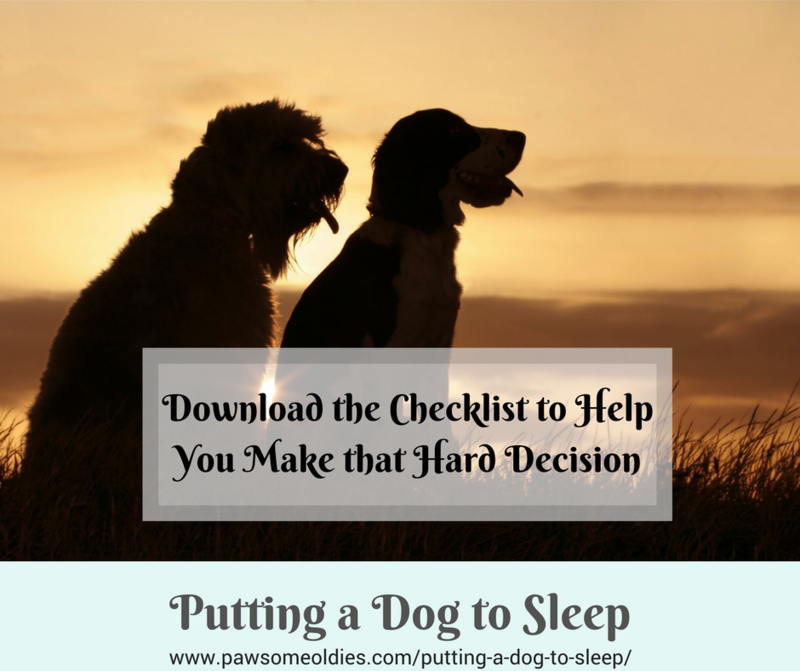 In my own case, the decision was almost made for us in the sense that putting my beloved dog to sleep was the only choice. My dog Hana had a brain tumor and one day she just had a seizure that lasted for over 20 minutes. No amount of anti-convulsion drugs could stop the seizing. As we were at the clinic watching the vet frantically trying to put one drug into her vein after another, to no avail, we knew “the time” had come. Our vet didn’t tell us what to do as I think he needed us to make that decision ourselves. When we told him we decided to put our dog to sleep, he looked relieved and later told us we made the right decision. Maybe we did, but that didn’t stop me from feeling guilty and asking all the “what-if” questions… That’s natural. That’s part of coming to terms with the loss. Putting a Dog to Sleep – How is it Done? Most vets these days use a “two-drug” method. The first is an overdose of either a sedative (or a “cocktail” of two sedative drugs) or an anesthetic. This puts the dog into a deep state of sedation. The second drug given is the actual “lethal” one, which is commonly an overdose of a barbiturate. 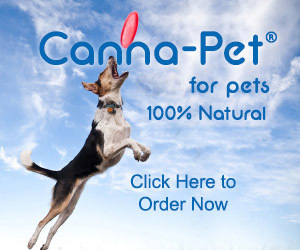 The drug may be given to the dog as an injection, or via an IV catheter. The overdose of barbiturate causes a rapid onset of cardiac arrest, and the dog passes away within 15-60 seconds. It is considered painless. Sometimes, if a dog is already unconscious, the first sedative may be omitted, and only the barbiturate is administered. There may be movement just after death, like a last reflex gasp, or muscle twitching. Sometimes, the dog may release his bladder and/or bowel contents. All these are not signs of pain, or struggle, or that the drug dosage is not enough. Once we told the vet our decision to let Hana pass peacefully, the vet left us so we could have some private moments with her. We hugged and kissed her and told her to be strong and not to be scared. We told her how much we loved her, and that she would always be our beloved dog. Unfortunately though, at that point, she was still seizing a bit and I don’t think she could feel or hear us anymore. Then we told the vet we were “ready”. Although Hana was already heavily sedated because of all the anti-convulsion drugs, the vet still chose to give her a sedative. (Even she was heavily sedated, she was still twitching a bit due to the seizure – that showed how hopeless the situation was). Then the vet asked if we were ready for the second injection. We stroked her body for one last time and said our final goodbye. Then the good vet asked if we wanted to keep some of her hair. Of course we did! So he shaved off a patch of her hair and put it carefully in a Ziploc bag for us. I was really grateful for the vet as I would never have thought of asking at that moment. After Putting a Dog to Sleep – What’s Next? After euthanasia, we need to decide what to do with the dog’s body. Most vet clinics have connections with some pet crematorium and the clinic may be able to arrange the cremation for you. If you want the ashes back (who doesn’t? ), you need to have a private cremation. Usually it takes 5 to 7 days to get the ashes back. You may choose to bury the dog’s ashes in your garden, or put the ashes in a pet urn inside your house. All the decisions I talk about here can be very stressful, to say the least. My suggestion is, if you have an old dog, plan ahead – even though she is still healthy. I know, nobody even wants to think about something as sad as putting a dog to sleep, but when you are not drowned in sadness, you make better decisions. You can think of all the details, such as where (at home, or at the clinic) and when to do it, and what to do with the body, etc. I also suggest that you make sure the vet who will be euthanizing your dog is caring and compassionate. Believe me, it could make a big difference. This is still a very raw and painful topic for me to write (teary-eyed while typing), but I hope this article can help you make that tough decision a little easier. If you would like to share your experience, or are having trouble coming to terms with putting your dog to sleep, write down how you feel below. I have set up this Pawsome Angels Pet Loss Support Group to support dog parents who have lost, or are going to lose, their beloved dogs. Feel free to join and share your feelings.